For about the last month, I’ve been quietly knitting away on my Targhee Color Study yarn. I decided early on that I wanted it to be a Betty Mouat Cowl. I bought Kate Davies’ book Happit over vacation, and it seemed like the perfect fit for a yarn with stripes that were not short but not exactly long. And, I had about the same yardage as called for in the medium size, though it’s a bit heavier than the yarn she used. Want to know why you should do a gauge swatch? Here’s a cautionary tale. I skipped the swatch and went with the time-honored practice of wildly guessing. Knowing the yarn was a bit thicker and a lot poofier than the yarn called for, I used one needle size up, and cast on 12 pattern repeats – 3 fewer than the medium-sized cowl. The cowl is composed of two halves, knit from the outside in, then grafted together. My plan was to knit through the chart 3 times, as directed, then weigh the yarn, and see if I had enough left for the other half. Looks nice, but it was destined for the frog pond. 1) The fabric was a little tighter than it needed to be; it could definitely take another needle size up. 2) The biggest concern? The loop was too small. The medium BMC is supposed to go around the neck twice; this was too short to go around twice, but would be awkward and useless only going around once. 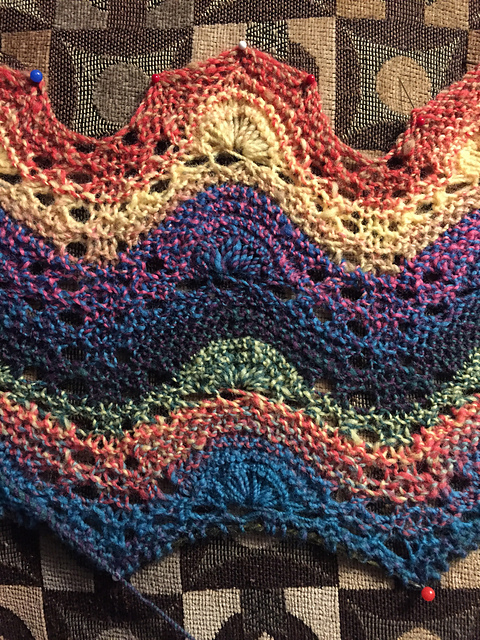 There was good news too: 3) The cockleshells held their shape after blocking; I was concerned that the bouncy Targhee would not hold its shape in lace, and was happily disproven. 4) the stripes were working up perfectly. Items 1, 2, and 3 could have been figured out with a swatch. As it was, I had to rip the whole thing out, so it was essentially a big swatch anyway. Good grief, Rebs. MAKE A SWATCH! eesh. You’d think I’d know this after knitting prolifically for almost half my life. Thankfully all I wasted was time. I did actual math this time and divined that I could go up to 14 pattern repeats, knit through the chart repeat 3 times, and it’d use the same amount of yarn as knitting through the chart 4 times with 12 pattern repeats, with enough wiggle room to go up a needle size. It did seem to go faster the second time around. I didn’t even mind the hours of kitchener stitch to join the two halves. A garter-based lace pattern is a bit of a pain to do in the round, and although I don’t mind purling, I certainly don’t mind not purling. The pattern includes a link to a way-cool tutorial for no-purl garter in the around, but it involves using two balls for alternate rows. This would ruin my nice stripes. So I decided to be a punk and just knit the thing flat. This made blocking really easy, and while the seam (above) is not the prettiest bit of sewing I’ve ever done, it’s also really easy to find and put at the back of my neck when I put it on. Some color analysis: When I spun this, I tried to mix the colors up as much as possible for maximum barber poling. Interestingly, it ended up that most of the yellow ended up in the first half of spinning (the top half above), and most of the tan ended up in the bottom half. Yellow added a lot of pop and vim, while the tan blended more and made things more muted and brown. This is exacerbated by the big pop of yellow in the top, and the big blended portion of near-complements coral and green in the bottom. It’s almost like two colorways. I’m very curious about the point at which optical blending occurs. Perhaps the biggest single factor is the size of the dots of color. Difference in value is also very important, as well as hue and saturation But here’s a different factor I hadn’t thought of: how blended a hue is. You could arrange colors into a sort of heirarchy of how blended they are. Primary colors are the least blended; the secondary colors (between them on the color wheel) are more blended but can still be plenty bright. If you blend a little bit of a color’s complement, you add some richness and complexity to the shade – it’s starting to be more blended, but it’s still recognizable as itself. The most blended colors are when you take complementary colors on opposite sides of the outside of the color wheel and mix them together in equal amounts: this always makes some kind of brown. Is this just another way of describing hue? I don’t know. But anyway, when you’re talking about combining dots of two different solid colors, it makes sense that when you take two colors from the outside of the color wheel, they would be less likely to optically blend than a color from the outside plus one in the middle. Translation: If you want your dots of color to pop, don’t involve tan or brown. Best to use colors that are both bright and different in value. If you want them to blend, brown is a friend. I was thinking of giving this cowl away, but it is a little unique for someone to appreciate who was not intimately involved in its creation. Plus, I realized, my whole summer’s memories are spun into this yarn. I decided to keep it, which meant I needed to figure out how to style it. The two halves are quite different. I don’t really like being able to see both of them at once. Thankfully, the original styling shows it folded in half and wrapped twice. This means that I effectively have two colorways to wear! Though that might have more to do with the attractiveness of the model. My eyes went nuts when they saw the first picture of you wearing that gorgeous cowl.Cowl? Baby? Cowl? Baby? They kept popping back and forth, unable to settle. Then I got to the last picture and my brain exploded! Excellent work on both! Hahaha! Lol thanks. Her face is so funny in that one. That’s a great looking cowl. You did a wonderful job spinning and knitting it. I love that you can get two different looks from it. This came out wonderfully — I love that you have two totally different pieces in one. Targhee is my favorite thing to spin. I love the bounciness. Thank you! Yes the bounce is pretty amazing.